We’re often asked what make or type of solar panel that we use. Companies that only use a single model of solar panel do so for their own reasons; it’s usually down to the price that they’re paying for them. Many of our larger competitors import container loads of unbranded solar panels then put their own labels on them. 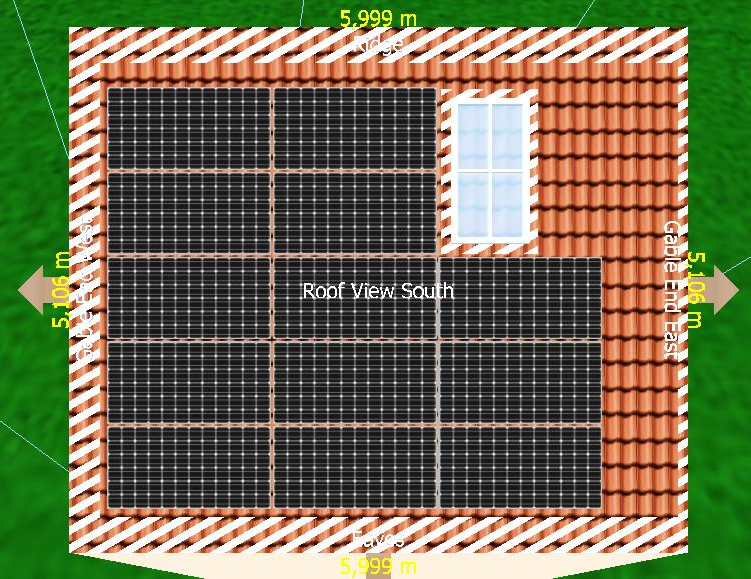 We assess each potential solar panel installation site individually. Only by taking into account the size and shape of the area we have to work with, looking at issues such as obstructions and shading, then considering how prominent the finished installation would be, can we select the most suitable products for the customer. Often there is more than one solution, in which case we present the customer with their various options. The hatching around the roof represents an area that we deliberately exclude. The house is semi-detached with the gable end on the left. Installing too close to the gable end, the eaves or the ridge would expose the solar panels to very high wind loading. We also keep away from the ridge as we don’t want to disturb the pointing, and we keep away from the eaves because we don’t want water cascading off the roof during heavy rain, nor do we want avalanching as snow starts to melt. We have a roof window which restricts the available area further. The Panasonic 240W solar panels look like the better option as their small size allows us a 3.12 kW system. 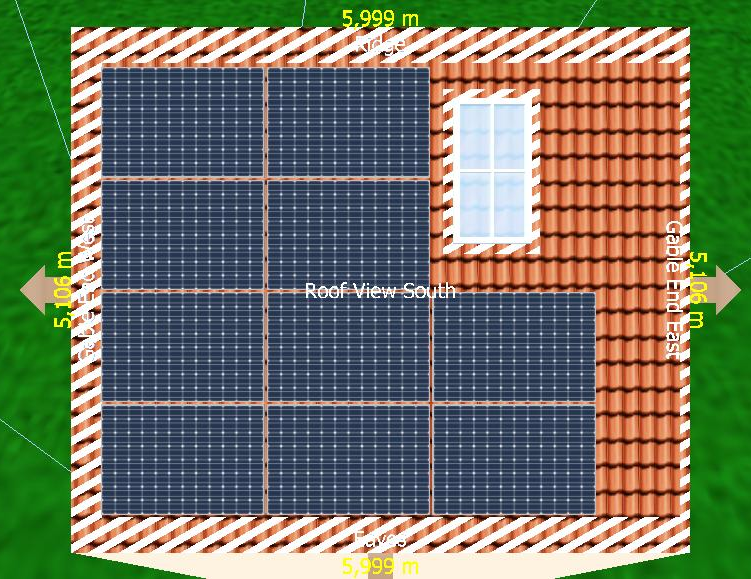 The Seraphim 285W solar panels only allow us a 2.85 kW system. The Panasonic system would therefore be 9.4% higher in capacity than the Seraphim; the cost however of the Panasonic system would be 28% higher (over £1000 more). The Panasonic 240W solar panel has a black frame, whereas the Seraphim 285W solar panel has a silver frame – this is another factor to consider if the roof is in a conspicuous location. Both of these proposals for solar panel systems have their merits and drawbacks, therefore we would present the customer with each and allow them to make up their mind. In the end it could be an aesthetic or a financial motivation that leads to the decision. The solar panel industry moves at a fast pace, so our range of solar panels is constantly changing. Nevertheless, we always choose the most appropriate products for each scenario and never stick to one option. At the time of writing, our range includes household names such as Hyundai, Sharp, Panasonic and LG, together with names that are only well known in the solar panel industry such as Phonosolar, Seraphim, Canadian Solar, Perlight and Yingli.